At the beginning of the 19th century John Newling was recorded at inclosure as having the land now occupied by 33-39 Church St. It continued to be occupied by members of the Newling family until 1962. they generally prospered as threshing machine contractors. He was living in (present 37-39) Church St in 1825 when he made his will bequeathing his wife Elizabeth his two cottages with gardens for her life. In 1825 he occupied one cottage and his son John the other, with yard, garden & other buildings (now occupied by nos 33-35). At his death the cottage John lived in and half the orchard would go to his eldest son Thomas and the other remain with John. In the 1841 census three Newling households were shown, side by side. John’s widow Elizabeth headed one, son Thomas (already a widower with children) another and son John with his family in another. John was already a drill man by then, although Thomas was a gardener. He had married Hannah Ansell from Hauxton and appeared to live there at least until 1825 before moving to Harston, probably by his father’s death in 1829. By the time Thomas died in 1863 his sons had died before him but his daughter Mary Ann, a spinster, lived in 37-9 Church St until her death in 1898 at the age of 81. In 1881 she was recorded there as a pauper, and as blind. Her younger sister (by 3 years) Rebecca lived with her, also a pauper. Thomas’s will ensured that during her life she would have the sole use and occupancy of one room of ground floor of the Church St cottage and the exclusive use of a bed and sufficient of his furniture to render the room comfortably habitable. 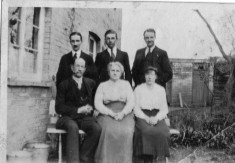 Rebecca died, a spinster, in Dec 1913, at the the age of 95 at the Chesterton Union (workhouse) but was buried at Harston. Thomas’ brother John, and his family, also lived in the 37-9 Church St cottages but seemed more prosperous. John, his sons John and Thomas, grandson Thomas, great grandson John were all in the ‘Thrashin machine’ business, using steam driven engines to thresh the corn. they had a number of sheds on their land adjoining the cottages where they stored their machines and carts. They visited all the neighbouring farms so had plenty of work and were recorded as machinists from 1851 until 1916. From 1922-29 Kelly’s directory recorded them as farmers, presumably doing so well they were able to buy or rent land to farm. In 1901, four Newling households were living side by side in Church St, presumably all in the three adjoining cottages, now only No 37. The two Sarahs, one (1838-1907) widow of John, one sister (1824-1909) of John, living on their own means. 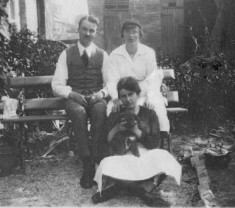 Then Frederick the son of John Newling (1864-) , Frederick’s wife Rose and three of their children, and finally the household of Frederick’s cousin, Robert Newling (1870-), wife Emma and four children. Photos submitted by Rob Sharp show Frederick, wife Rose, three of their sons, a daughter and son Robert’s wife Alice Pointing. Frederick was an agricultural engine driver with his own business, while Robert worked as a coalman. Frederick still lived there in 1911 but Robert had moved away. In 1940 Frederick’s brother Thomas died leaving the double cottage, machinists shops, outbuildings, garden (part which had been site of a third cottage) to his daughter Kate Ethel Hopkins, married to Bertie Frank Hopkins (a haulage contractor). In 1963 the property was left to their son Thomas Clarence Frank Hopkins a warehouseman who lived in 37 Church St while Kate & Bertie had lived in 39 Church St, the adjoining cottage. Tom and Isabella his wife lived there at least until the 1980s when they moved to Hauxton. isobella Hopkins came from I believe Newcastle. We as a family knew them very well. They had two sons Donald who at one time lived in Royston and Trevor who at one time still lived in Church Street but I don’t know if he still does.